Rumour and rumour but nothing concrete, and the latest of rumours is about the next-gen Apple iPhone which comes via iLounce, and intimates of a new design iPhone handset that may be similar to the present version. Some of the key changes which the Apple 3G iPhone will have its metallic plastic exterior is to be replaced with a plastic version. More whispers come in about the possibility of a thinner chrome bezel with highly tapered edges along with additional connectors and sockets surrounding the dock connector, but more interestingly there is mention of an added sensor which can be located next to the earpiece. These rumours came about by an iPhone case manufacturer who is generally “in the know” about info concerning the upcoming Apple iPhone hardware. 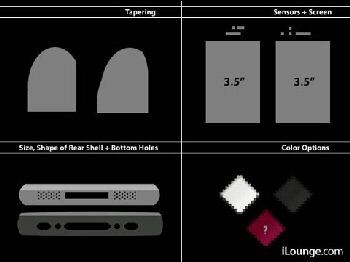 Case manufacturers are nearly always supplied with physical hardware dimensions via Apple allowing them to gain a head start on developing accessories. As is, the current Apple iPhone handset features two sensors near the earpiece, firstly an ambient light sensor that allows the iPhone to adjust backlight intensity based on current lighting conditions, and secondly a proximity sensor that turns off the display when the iPhone is put to the ear. This rumour of yet a 3rd sensor may well mean a front facing video call camera which has been speculated for use on the 3G iphone by Kevin Rose, founder of Digg. Also there is speculation about a new tapered design lick that of the Apple MacBook Air. You will still have the chrome bezel there and should make it better along with additional sockets for maybe Apple iPhone accessories such as radio hardware or GPS. But the plastic casing will look like metal due to its high gloss finish. Just bear in mind when pondering these rumours that Apple seems to be notorious for leaking misinformation to side track the iPhone rumour makers in the first place. So it’s a waiting game to see if the Apple 3G iPhone new design does come to anything.